In an effort to spread awareness, ESET has published a infographic of how phishing attacks works. We know now a days spammers sends mail like the trusted bank or some other trusted one, which emails contains the link to login with their bank details. This will send the passwords and details to the spammers. So don’t click any links regarding login in email. Banks wont send email like this. This kind of hijack is called as Phishing Attack. The two biggest tips are: never share your bank details & passwords and another one don’t log into pages linked directly via email. You might want to pass this infographic use our email sharing feature below of this post. 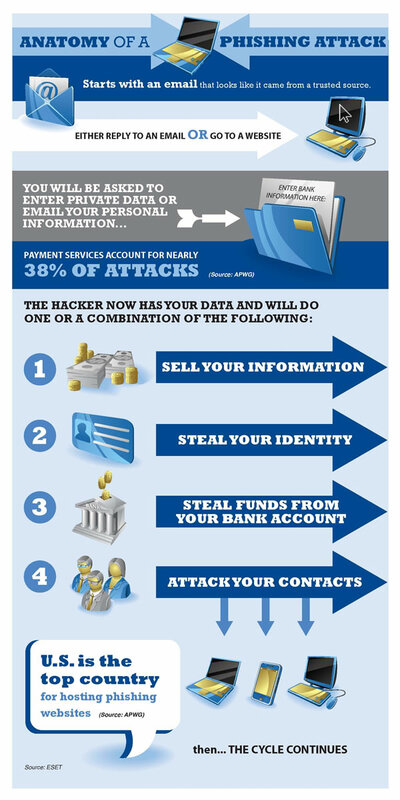 Just have a look how Phishing attack works. Beware of Phishing Attack, Just share this post to your friends to be secure. it’s quite true that US is the main creator of Phishing..but now-a-days everyone tries to do a phishing attack to just try his luck.. But still you need to be careful as the technology has advanced so fast that even genuine looks can be faked..